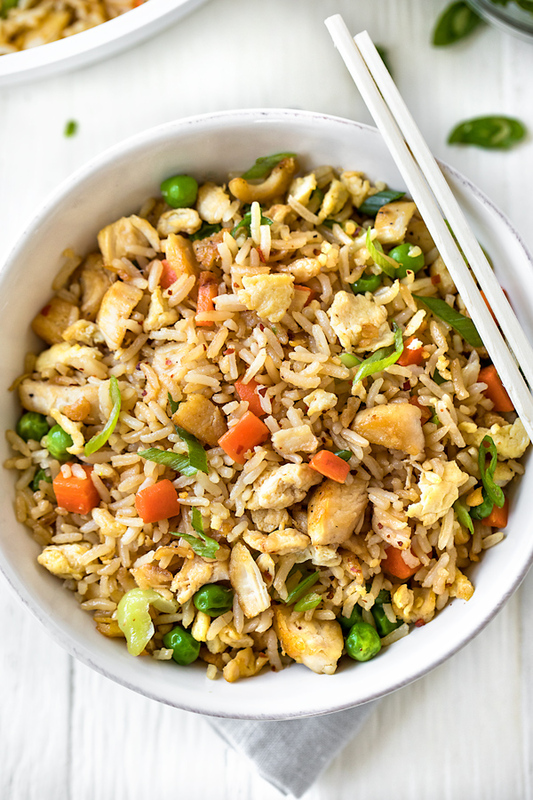 Chicken fried rice is an incredibly quick and tasty meal, and with this delicious recipe, you can whip up this take-out inspired dish in no time at all! To say that I have a lot of experience preparing chicken fried rice may be a bit of an understatement. There was a time when my son was in his early adolescence, and it seemed like that was all he wanted to eat! Now, as a young adult, he’ll eat anything; but as a kid, he was quite the picky eater and getting him to truly wholeheartedly enjoy a recipe was a bit of a challenge. 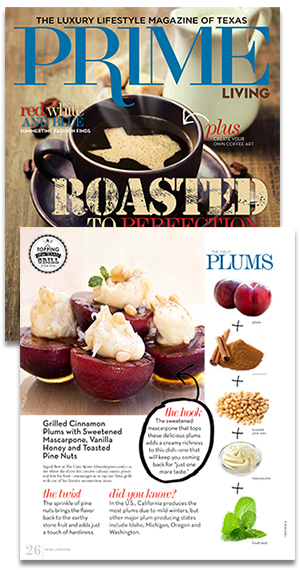 So I would tend to prepare the recipes I knew he loved and that were protein-filled and healthy, on rotation. 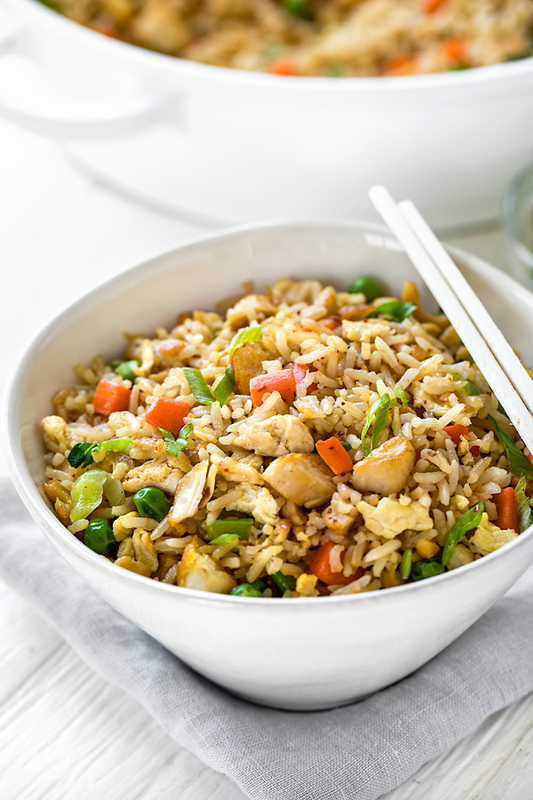 For that reason, chicken fried rice was the perfect option for him—simple, healthy ingredients and full of flavor. To this day I still love whipping up fried rice when we have the ingredients already on hand for a no-fuss, hot and delicious meal, one which we can even jazz up a little according to our tastes! Part of the convenience of preparing fried rice is that the list of ingredients is relatively small but flavorful, and the cooking process quite simple. The kind of veggies one uses is totally up to personal taste, and I like the classics here: peas and carrots. Where I do take some liberty is in adding some chopped bok choy, because I happen to love it and appreciate the extra greens! 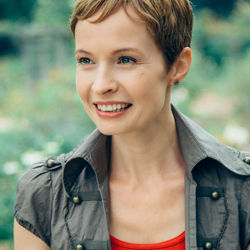 For the meat, you can use chicken, beef, pork, shrimp, or go meatless altogether for a vegetarian option. Fried rice is one of those dishes you can truly get creative with. There are of course slightly different methods of cooking up the fried rice in the pan. Some folks like to warm up the veggies, then scramble the egg, then add the rice and remainder of the ingredients. Others prefer to stir fry everything before scrambling in the egg at the end, and I happen to be in this camp. To begin, I mix together some soy sauce, rice vinegar and sesame oil in small ramekin, and set this mixture aside to drizzle over the fried rice mixture in a moment. Then, I place a large, heavy-bottom, non-stick skillet or pan over medium-high to high heat, and drizzle in a touch of avocado or peanut oil. When nice and hot, I add in the cooked chicken and allow it to crisp in the pan for a minute or two, then I add in some garlic and ginger, and stir to incorporate. Next, I add the cooked, room temp rice into the pan, stir to combine, and allow it to crisp and fry a bit with the chicken and aromatics; then, I drizzle in some of my soy sauce mixture, and stir to incorporate. To the rice and chicken mixture, I add my veggies and stir to combine; then, I push the rice mixture to the sides and add my whisked eggs, moving them around to create small scrambles. To finish, I fold the scrambled egg into the rice mixture, sprinkle over some green onion, and serve piping hot! 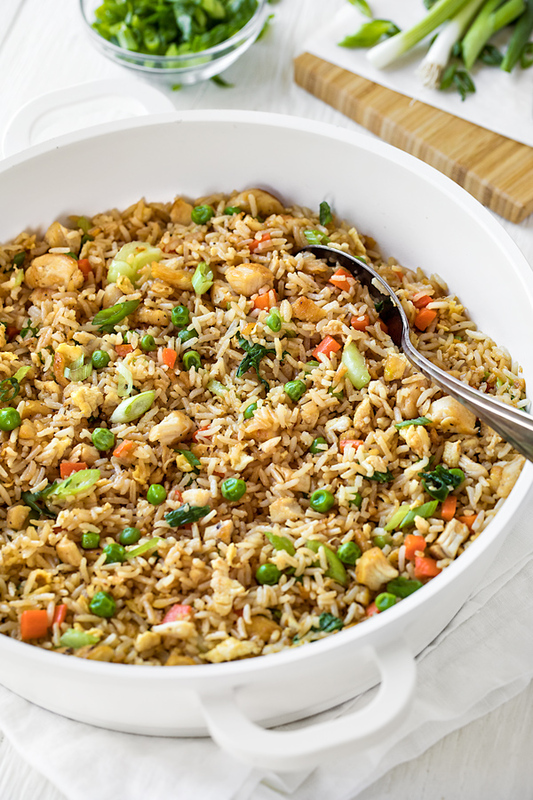 Chicken fried rice is a classic take-out dish that’s a breeze to prepare with minimal ingredients—it’s a quick Asian-inspired favorite! – In a small ramekin or dish, mix together the soy sauce, the rice vinegar and the toasted sesame oil, and set this mixture aside to drizzle into the rice a bit later for flavor. – Place a large, heavy-bottom and non-stick pan over high heat, and drizzle in about 1-2 tablespoons of the avocado or peanut oil; once hot, add in the cooked chicken, and allow it to crisp up in the hot oil for about 1-2 minutes. – Next, add in the garlic and the ginger, and stir to incorporate until it becomes aromatic; then, add in the cooked, room temp rice, and stir to combine, allowing the rice to crisp up a bit and become hot, for 2-3 minutes. – Drizzle about half of the soy sauce mixture into the rice to begin with, and stir that in to incorporate it very well; taste to see if you’d like to add more. – Add in the peas, carrots and baby bok choy (if using), and stir to warm through. – Push the rice mixture to the side of the pan, creating room to pour in the whisked eggs; then, using a spatula or spoon, stir the eggs to create small scrambles, and fold the rice into the scrambled eggs to combine everything. – Sprinkle in the green onion to garnish, and serve piping hot. Leftover chicken, a great time-saver: Using leftover, cooked chicken or good quality rotisserie chicken that you diced up is a really great way to go for this recipe, as it saves time. Alternatively, you could quickly sear up 1 pound of chicken breast tenderloins if you prefer, and dice those. 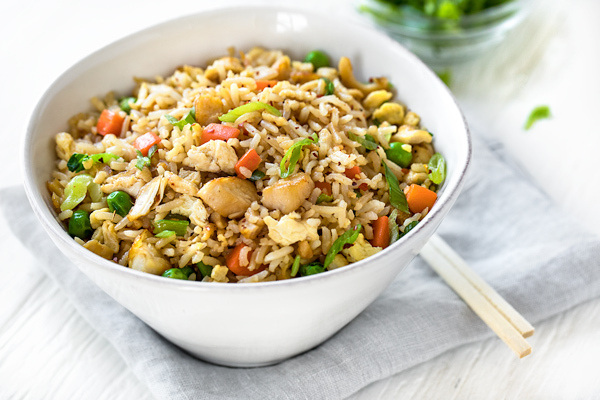 Pre-cooked, cooled rice: Chicken fried rice is the perfect recipe to prepare when you happen to have leftover rice as well that you are looking to make good use of. But if you need to prepare some rice specifically for this recipe, then cook up about 1 1/2 cups of rice and allow it cool completely. Allowing the rice to cool is important; because if you use hot, fresh rice, it will steam and stick to the pan. White rice or brown: While white rice is typically used for a chicken fried rice recipe (and is my personal pick), you can certainly sub brown rice if you prefer. Simple veggies: You can add any sort of veggie to this recipe, but I keep things simple and classic here and use peas and carrots. I also sprinkle in some sliced baby bok choy, but this is totally optional—I personally love extra greens in my chicken fried rice. Other tasty add-in options are small pieces of asparagus, broccoli, and even baby spinach. 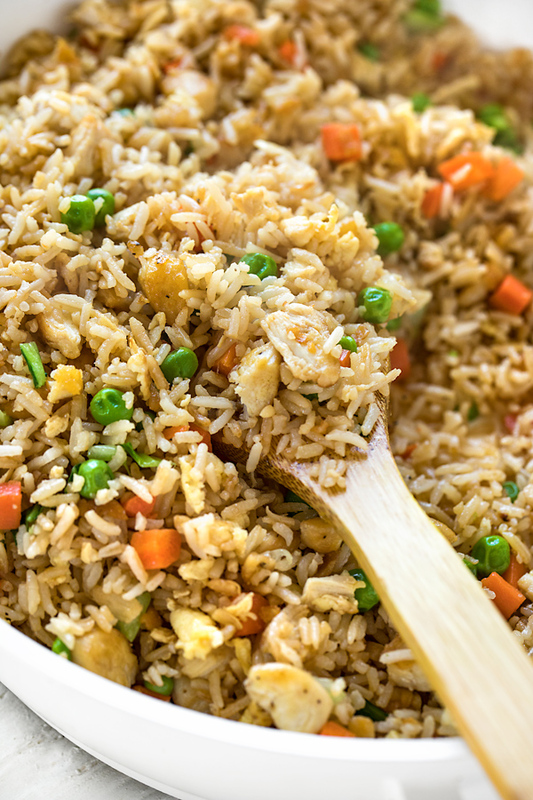 Prepare ahead for easy fried rice: You could prepare all of the components of the recipe the day before, allow them to cool completely, and keep in the fridge. Then, the next day you can simply stir fry things up in a hot pan and proceed with the recipe by scrambling the egg, and finishing. Hungry for more Asian-inspired recipes? Check out this Teriyaki Chicken, this Spicy Garlic Beef Bibimbap, this Mongolian Beef, or these Chicken Lettuce Wraps!